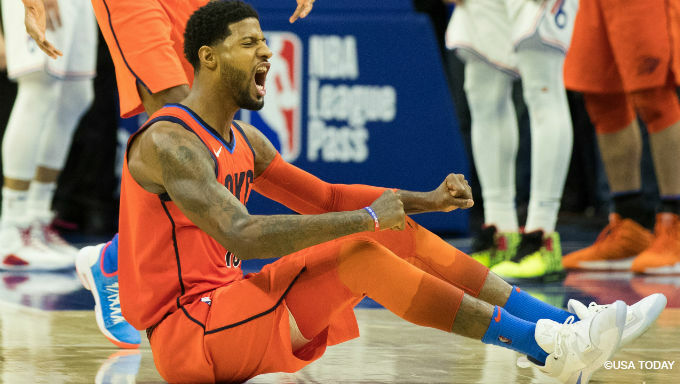 Bet Paul George for Defensive Player of the Year at +250 with 888Sport. Paul George has taken his game to another level. He made headlines in July when he spurned the Lakers and instead re-signed with the Oklahoma City Thunder. His decision to re-up with Russell Westbrook instead of teaming up with LeBron James in his hometown was questioned by many, but no one can argue with these results. George has been sensational in his second year with the Thunder. His offense has blossomed, averaging career-highs in points (27.1), 3-pointers (3.6), rebounds (8.1) and steals (2.3). He’s helped the Thunder to a 31-18 record, third in the West and within shouting distance of the first-place Warriors. Last Thursday he was awarded with a spot in the starting lineup for next month’s All-Star Game in Charlotte over the likes of Nikola Jokic and Anthony Davis. He also fits what voters – NBA betting fans look for in Defensive Player of the Year winners. He plays for an elite defense in Oklahoma City and was named an All-Star starter last week. He isn’t a true big and has never won the award before, but there isn’t another true competitor out there that fits those bills. George’s offense has been exceptional, but it’s the defense that’s really flourished in Oklahoma City. His defense has always been top notch, as he was named to the All-NBA Defensive Second Team in 2013 and 2016 (and the Third Team in 2014). He’s averaged at least 1.6 steals in seven of his eight healthy seasons in the NBA, and Indiana was routinely among the league’s best defenses while he was the face of that franchise. But even by his standards, he’s flipped a switch this season. The Thunder are second in the NBA this season in defensive efficiency, behind only the Bucks. That’s impressive in its own right, but when considering that they’ve done this all without 2016 year’s All-NBA Defensive Second Team forward Andre Roberson it becomes remarkable; Roberson was on track to be a First-Teamer last season before suffering a gruesome knee injury that’s kept him out a full calendar year. So George has picked up the slack. He routinely guards the opponent’s best player, which in the Western Conference means a serious nightly assignment. The Thunder are an incredible 8.9 points per 100 possession better defensively with him on the floor (106.0) than with him off it (114.9). In terms of team efficiency, that’s the difference between the No. 7 and No. 29 defenses. George is on pace to become just the second player since 2005 to average 6.5 defensive rebounds, 2.0 steals and 0.5 blocks per game. The only other player to reach those thresholds was Draymond Green in 2017, and he won Defensive Player of the Year that season. George has all the credentials. Rudy Gobert is just behind George in futures odds for the award, but Utah’s lack of team success could hurt him. The next two players with the best odds are both nursing injuries Minnesota’s Robert Covington and New Orleans’ Anthony Davis, who also has requested a trade from New Orleans.. It’s tough to see either winning the award after missing weeks of game action. So that leaves George. He’s always been one of the league’s best two-way players and has reached new heights, all while doing so in the juggernaut of a Western Conference with the best wing talent in the game. He’s the frontrunner for Defensive Player of the Year right now at +250, and that’s a bet worth considering with 888Sport. George is healthy, the Thunder are rolling and neither are showing any signs of slowing down.